This double dresser is both smart and beautiful. It features a wonderful traditional design and is versatile. The top two drawer fronts fold down to reveal tray drawers, making this dresser a possible bedroom entertainment center. There are also six ample sized drawers to provide you with a good amount of bedroom storage. Add the gorgeous Landscape Mirror for extra style and function. This gorgeous landscape mirror is carved and has paneled sides. It is a great addition to the Double Dresser and will add both a traditional style and a great amount of function to your bedroom. The Viniterra Large Double Dresser and Landscape Dresser Mirror by Fine Furniture Design at Malouf Furniture Co. in the Foley, Mobile, Fairhope, Daphne, and Gulf Shores, AL area. Product availability may vary. Contact us for the most current availability on this product. Finish The Collection offers two finishes: The Verona finish and Aged Gold Trim finish. Verona is hand-rubbed, with a polished top coat to create a time worn look. Aged Gold is the same as Verona but with a hand painted trim offered on select pieces. Handles & Hardware Traditional metal pulls. Mirror The gorgeous landscape mirror adds style and function to your bedroom dresser. Storage The top two drawer fronts fold down to reveal tray drawers, making this dresser a possible bedroom entertainment center. There are also six ample sized drawers to provide you with a good amount of bedroom storage. Drawer / Shelf Construction Framed and fit flush with case; constructed with half inch solid wood sides; joined with English dovetails on the front and back of drawer; assembled with glue blocks on underside. Drawer Suspension Crafted to open smoothly on double-shoulder, wood on wood guides; carefully sanded and finished on the inside. Description: Top Finished so canister lights and electrical harnesses are not exposed to give cases a completed finished appearance. Case Construction It is crafted of solid Walnut, selected hardware, Walnut veneers and figured Rustic Cherry veneers with Laurel Burl veneer accents. 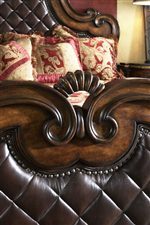 The Viniterra Collection is a bold expression of European Traditional design for today's luxury homeowner. 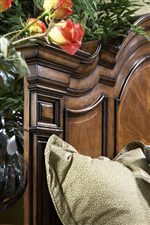 It is crafted of solid Walnut, selected hardware, Walnut veneers and figured Rustic Cherry veneers with Laurel Burl veneer accents. Several key pieces feature inlays of Walnut Cherry and Laurel Burl. The Viniterra Collection offers two finishes: The Verona finish and Aged Gold Trim finish. 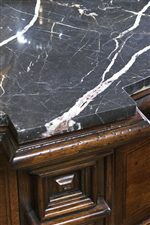 The Verona finish is hand-rubbed, with a polished top coat to create a time worn look. The Aged Gold is the same finish as Verona but with a hand painted trim offered on selected items to create drama and add a unique flavor to the collection. Viniterra spans many rooms in your house with pieces for the bedroom, living room, office, and dining room. With so many options, the Viniterra collection of furniture truly helps you create a home design of your dreams. The Viniterra collection is a great option if you are looking for Traditional furniture in the Foley, Mobile, Fairhope, Daphne, and Gulf Shores, AL area. Browse other items in the Viniterra collection from Malouf Furniture Co. in the Foley, Mobile, Fairhope, Daphne, and Gulf Shores, AL area.